Fuse marks Insomniac Game's first foray into multiplatform gaming. 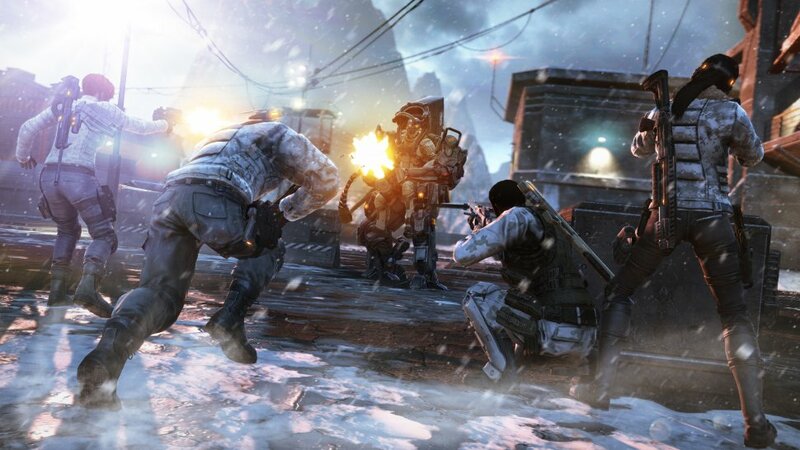 The squad-based, third-person shooter is built for cooperative play. Our Co-Op FAQ will guide you of co-op functionality, including player counts in local, online, and combo play, player connectivity, and character and story progression. How many players can play Fuse locally (couch co-op)? How many players can play Fuse via system link or LAN? How many players can play Fuse online? What direction is the screen split in couch co-op for Fuse? How do you begin a co-op session in Fuse? How does save game progress work for co-op play in Fuse? Can I join a game if the host is further along than me in Fuse? How many maps are there in Echelon mode? How does Leap work in co-op in Fuse? Does Leap work with a full roster? How does Fuse handle story disparity? Two. Local players must be added in a lobby. System link is not supported. Two players are supported in combo co-op. No, a guest account may be used. You can invite players from the lobby screen or you can invite players with full drop-in / drop-out support. All progress is shared. UNLESS you join a campaign which is further along in the story than your personal game. Then your story progress will NOT be saved. Any player can play with any other player, no matter what level they are. If a player is further along your progress will not be saved for story progression, but character progression remains. XP is used to unlock individual character skills. In both the story and Echelon modes XP is awarded both individually via kills and to the group for completing objectives. All XP and unlocked skills carry over to individual games. In a solo game the player controlled character will receive XP for kills, while the AI controlled characters will level up as well, but at a slower rate. Players must assign all character skill points. No. The roster remains the same in both campaign and Echelon mode. What modes of co-op play are available in Fuse? When a player leaps to another character in co-op they will take control of their own version of that character, no matter who is hosting the game. Example for a two player game: Player One (the host) has a roster of level 5 characters. Player Two has a roster of level 20 characters. When Player One leaps from his level 5 Dalton he will take control of his level 5 Naya. If Player Two then Leaps from her level 20 Jacob she can take control of her level 20 Dalton. Her version of Dalton will a have all the skills and perks that she has unlocked in her individual game. If the Host then chooses to Leap to Jacob, he will take control of his level 5 Jacob. Character skill levels will remain tied to the individual player’s profile. All progress is shared. UNLESS you join a campaign which is further along in the story than your personal game. Then your story progress is NOT saved. The player with the least amount of story progress should host the campaign mode so their story progress is saved.